Ancestors of our eating apples, the Crab Apple Tree once grew wild across Europe. At some distant time it mixed with another wild apple from Central Asia, and the result was our eating apples. But the Crab Apple did not go away. Instead it remained as an ornamental tree, and it has been developed over the years for its flowers and for its decorative fruit, which in many types is also excellent for turning into preserves. Most of the trees we call crab apples are derived from a wide range of natural species, from all over the northern hemisphere, and many are hybrids between different species of Malus, the botanical name for all apples. 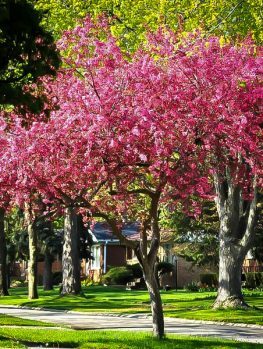 Much more resistant to cold winters than many other spring-flowering trees, Crab Apple Trees are wonderful choices in colder areas especially, and their beauty rivals the flowering cherries of warmer zones. Add in fall color, attractive fruits, and colored spring and summer leaves too, in many varieties, and you have a small tree that is beautiful in several seasons, and that should be in every garden. Crab Apple Trees are versatile plants to work with in the garden. They are a top-choice when you want a smaller tree to plant on a lawn – perhaps because you have a small lawn, or you already have some larger trees in your garden. They add another height level, since most grow not much larger than 25 feet tall, and many are much smaller. Many are fast-growing, adding 2 feet or more a year, so you don’t have long to wait for a beautiful tree. For this reason they are popular for new gardens, and they beautify it while other trees are still developing. They can be planted in courtyards and paved areas too, and in beds, mixed with other flowering trees and shrubs. Close to your home, or further away to be admired from a distance, they bring interest and beauty to several seasons. They can even be planted in large pots and planter boxes, particularly if you choose a smaller-growing variety. They are popular and easy choices to turn into bonsai trees, and they look remarkable when in bloom, or when they are carrying fruit. Small-fruiting varieties are usually chosen for this. If you have a long driveway, then an avenue of Crab Apple Trees – all the same variety, or a mix of varieties – is an interesting way to make that driveway special. A row can be planted along your property line, or at the boundary of a natural area, where they will add extra color, but still look natural, and blend in. If you want to grow eating apples, not many people realize that Crab Apple Trees are universal pollinators, and by growing one or two near your fruiting trees, you are almost always assured of a heavy apple crop, no matter what varieties you are growing. You can also harvest your crab apples and turn them into a delicious fruit jelly or preserve. This is aromatic, spicy, and usually a beautiful pink color. Some cider makers like to add some crab apples to their mix, for the unique flavor. Crab Apple Trees are small to medium-sized trees, and some are small enough to be grown as large shrubs. Typical sizes are between 12 and 25 feet tall and wide, but smaller and larger trees are also seen. They have a central trunk, although they can also be grown with two or three trunks. The bark is usually handsome, with a glossy, rich chestnut coloring, and peeling strips. Older trees develop a rough bark, with lots of character. The foliage is deciduous, usually turning bright shades of gold, scarlet and deep red in fall, depending on the variety of tree. Leaves are between 1 and 4 inches long, simple ovals, with a pointed tip and serrated along the edge of the leaf. They are usually glossy and rich green, although in some varieties they can be deep red to purple. In early spring, shortly after the leaves emerge, and while they are still small, the flower buds open. The flowers are in clusters, often with many in a cluster, and they have five broad petals, opening like a star. They may be white, pink or red, and many different shades are possible, with different varieties. The flowers are 1¼ inches across – sometimes larger – and some varieties have double flowers, with ten, fifteen or more petals in each flower. When the petals fall tiny fruits can be seen, and these develop over the summer months, maturing in fall. The fruit often remains hanging on the tree well into winter, and sometimes right through to spring. Fruits vary a lot in size, from the size of small cherries to about 2 inches across, depending on the variety. They often hang in clusters, and they vary in color from green, through pinks and red, and into deep purples, depending again on the variety. When choosing which ones to grow, consider the flower color, the fruit, and the foliage colors too – there is a lot to choose from! Crab Apple Trees are easy to grow in most soils, except for very wet ones. They are usually hardy to Zone 4, and they will grow well all the way into zone 8, so they are versatile too. They are particularly important in colder zones, since most other flowering trees are only hardy to zones 5 or 6. 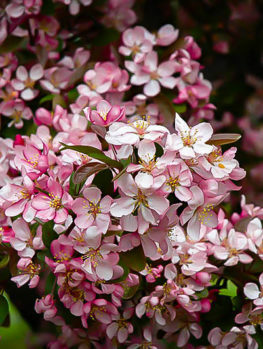 Plant Crab Apple Trees in full sun for the best blooming, although partial shade will also be tolerated well. Allow enough room, not just for the height, but for the spread too, since many are wide-spreading for such small trees. Keep new plants well-watered, and while mature trees have some drought tolerance, they will benefit from a deep soaking during longer periods of dry weather. Unlike eating apples, Crab Apple Trees don’t need elaborate pruning. In fact, many can simply be left to grow naturally. Some pruning in summer is helpful to keep your trees more compact. Simply shorten the new shoots by about a quarter to one-third, and also remove any overcrowded branches. Trees look their most attractive when left to grow as naturally as possible. Do not prune during wet weather, as this may encourage the spread of diseases. Older varieties of Crab Apple Trees suffered from several diseases, but newer varieties are mostly immune, so if you have had problems in the past, or live in an area with wet summers, choose a disease-resistant modern variety, and see the difference. All our eating apples are varieties of Malus domestica, which itself contains genes of both the European Crab Apple (Malus sylvestris) and a Crab Apple from Central Asia, Malus sieversii. That leaves us with about fifty other species of apples, from all across the northern hemisphere, including Japan, China and north America. All of these are collectively called ‘crab apples’, because the small fruit contains a lot of malic acid, which makes them sour. However, when cooked with sugar the high pectin content makes it very easy to create delicious preserves and jellies. Because there are so many different species, and they easily cross with each other, it is often hard to say what the parents of a particular variety are. There have been hundreds of varieties developed by breeders around the world, so there are lots to choose from, with different forms, flower colors, fruit sizes and colors, and with green or colored leaves. Disease has always been a problem, causing leaves to fall in summer, which can leave the trees looking untidy. Especially if you live in an area with wet summers, look for newer varieties, such as ‘Robinson’, or ‘Profusion’, which have been bred to resist diseases. A big trend in gardening is to use trees with colored foliage, which brings brightness and attention to your plants when they are not flowering. It is a great way to add color for months, just by growing a suitable variety. There have been many Crab Apple Trees developed that have wonderful colored leaves – usually red or purple. Varieties such as ‘Prairie Fire’ have wonderful richly colored leaves before and during the time the tree is in bloom, and some, such as ‘Summer Wonder’, are very special because their leaves remain a rich purple color not just in spring, but all through summer too. Here is a selection of Crab Apple Trees – look at the more detailed descriptions on our site of the ones you find most interesting. Crab Apple Trees are perfect for today’s gardens. Their smaller size makes them much more adaptable to smaller spaces, and with spring blooms, fall colored foliage and fruit in fall and winter, they bring interest for three seasons of the year. If you add colored foliage, you have a tree that is a dependable source of color from early spring to the middle of winter – a real ‘win-win’ for your garden. 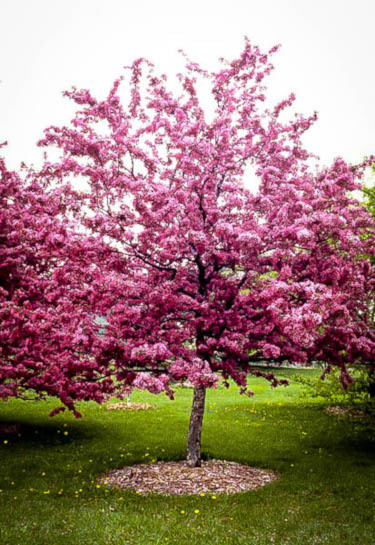 Everyone should have at least one Crab Apple Tree to admire – especially if you live in colder parts of the country, where you have a smaller selection of flowering trees. Nothing beats the dramatic flowering, fall color and bright fruits of Crab Apple Trees, so plant one soon.